Hillsboro is a city in Marion County, Kansas, United States. Hillsboro was named after John Gillespie Hill, who homesteaded in the area in 1871. As of the 2010 census, the city population was 2,993. Hillsboro is home of Tabor College, which had 766 students enrolled in Fall 2014. Hillsboro is located at 38°21′5″N 97°12′9″W﻿ / ﻿38.35139°N 97.20250°W﻿ / 38.35139; -97.20250 (38.351306, -97.202456). According to the United States Census Bureau, the city has a total area of 2.57 square miles (6.66 km2), of which, 2.56 square miles (6.63 km2) is land and 0.01 square miles (0.03 km2) is water. Hillsboro has two buildings listed on the National Register of Historic Places (NRHP). W.F. Schaeffler House Museum (NRHP), 312 East Grand Ave.
Mennonite Settlement Museums, 501 South Ash Street. Main museum on Memorial Drive (1 block west). 1876 P.P. Loewen House (NRHP). Previously known as the Pioneer Adobe House. A traditional Russian clay brick house from the Mennonite settlement village of Hoffnungsthal. The last remaining house of its kind in North America. Jacob Friesen Flouring Wind Mill is a detailed replica of the 1876 mill that stood in the Mennonite settlement village of Gnadenau. 1886 Kreutziger School No. 97 was in service from 1886 to 1960 approximately 5 miles north of Canada, Kansas. 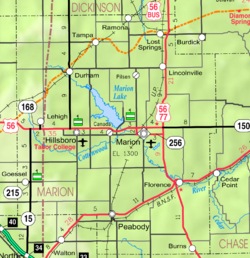 Marion Reservoir, north-east of Hillsboro, exits closest to farther from Hillsboro along US-56: French Creek cove (Limestone Road), Hillsboro cove (Nighthawk Road), Overlook and Dam (Old Mill Road), Marion cove and Cottonwood Point cove (Pawnee Road). As of the census of 2010, there were 2,993 people, 1,071 households, and 684 families residing in the city. The population density was 1,169.1 inhabitants per square mile (451.4/km2). There were 1,193 housing units at an average density of 466.0 per square mile (179.9/km2). The racial makeup of the city was 94.6% White, 1.7% African American, 0.3% Native American, 0.2% Asian, 0.1% Pacific Islander, 0.9% from other races, and 2.1% from two or more races. Hispanic or Latino of any race were 3.2% of the population. There were 1,071 households of which 28.7% had children under the age of 18 living with them, 54.6% were married couples living together, 6.3% had a female householder with no husband present, 3.0% had a male householder with no wife present, and 36.1% were non-families. 31.8% of all households were made up of individuals and 15.8% had someone living alone who was 65 years of age or older. The average household size was 2.31 and the average family size was 2.86. The median age in the city was 36.2 years. 19.8% of residents were under the age of 18; 20.2% were between the ages of 18 and 24; 17.7% were from 25 to 44; 21.5% were from 45 to 64; and 20.8% were 65 years of age or older. The gender makeup of the city was 48.7% male and 51.3% female. As of the census of 2000, there were 2,854 people, 1,086 households, and 710 families residing in the city. The population density was 1,435.8 people per square mile (553.7/km²). There were 1,209 housing units at an average density of 608.2 per square mile (234.6/km²). The racial makeup of the city was 97.48% White, 0.35% African American, 0.35% Native American, 0.32% Asian, 0.56% from other races, and 0.95% from two or more races. Hispanic or Latino of any race were 1.51% of the population. There were 1,086 households out of which 27.0% had children under the age of 18 living with them, 57.1% were married couples living together, 6.1% had a female householder with no husband present, and 34.6% were non-families. 32.0% of all households were made up of individuals and 17.4% had someone living alone who was 65 years of age or older. The average household size was 2.25 and the average family size was 2.85. In the city, the population was spread out with 20.4% under the age of 18, 17.3% from 18 to 24, 21.9% from 25 to 44, 17.1% from 45 to 64, and 23.3% who were 65 years of age or older. The median age was 38 years. For every 100 females, there were 92.3 males. For every 100 females age 18 and over, there were 89.4 males. As of 2000 the median income for a household in the city was $32,736, and the median income for a family was $42,465. Males had a median income of $31,188 versus $20,134 for females. The per capita income for the city was $15,544. About 5.5% of families and 9.7% of the population were below the poverty line, including 15.1% of those under age 18 and 6.8% of those age 65 or over. The largest employers in Hillsboro are education related, Tabor College and Unified School District 410, which have been in the community for over 100 years. Manufacturer Hillsboro Industries started business in 1968. In September 2014, Wal-Mart announced plans to build a Walmart Neighborhood Market store in Hillsboro and will open in spring 2015. There is also employment found in the agricultural sector, with Circle D Manufacturing, Hillsboro Industries, Ag Service, Cooperative Grain and Supply, and Country Side Feed. Hillsboro is also the home to Stone Creek Spas, the only hot tubs built in the state of Kansas. The Hillsboro government consists of a mayor and four council members. The council meets the 1st and 3rd Tuesday of each month at 4PM. City Hall, 118 E Grand Ave.
Tabor College, a private college affiliated with the Mennonite Brethren Church, is located in Hillsboro at 400 South Jefferson Street. In 2009, Tabor College built a new football complex that is shared with Hillsboro High School. Hillsboro is part of Hillsboro USD 410. The high school is a member of T.E.E.N., a shared video teaching network between five area high schools. Hillsboro High School, 500 East Grand Ave.
Hillsboro Middle School, 400 East Grand Ave.
Hillsboro Elementary School, 812 East A St. The Hillsboro High School mascot is a Trojan. All high school athletic and non-athletic competition is overseen by the Kansas State High School Activities Association. For 2010/2011 seasons, the football team competes as Class 3A. The Hillsboro High School girls basketball team won the 3A Kansas State Basketball tournament in 2007 for the first time since 1996. The Hillsboro High School football team won state in 2002, and went to state in 2006 and through the Semi-Finals. The Hillsboro High School track teams have won several state titles in both the girl's and boy's divisions. From 2004 to 2007, the girls track team won the State title twice in 2005 and 2007, and finished second in 2004 and 2006. In 2005, Track Coach Dennis Boldt was named NFCA National Boys Track and Field Coach of the Year for his accomplishments with the team in the '03-'04 season. Hope Valley Christian School, Private Grade School, 1808 Holly Rd, approximately 0.5 mile southwest of Hillsboro. Each USD 410 school has a library for student access. Students of Tabor College have access to the Tabor College Library at 400 South Jefferson Street. The city is served by the Hillsboro Public Library at 120 East Grand Avenue. The library is a member of the North Central Kansas Libraries System, which provides an inter-library book loan service between its members. The community is served by two weekly newspapers, the Hillsboro Free Press. and the Hillsboro Star-Journal. The Star-Journal is Hillsboro's oldest publication and the city's official newspaper, with the city's largest paid circulation. The Free Press is distributed free by carrier to residences in the city, and covers news for the greater Marion County area. The Wichita Eagle in Wichita delivers to Marion County on Sundays and Thanksgiving. The Salina Journal from Salina offers daily delivery yeararound. Hillsboro is served by numerous radio stations of the Wichita-Hutchinson listening market area, and satellite radio. See Media in Wichita, Kansas. Hillsboro is served by over-the-air ATSC digital TV of the Wichita-Hutchinson viewing market area, cable TV, and satellite TV. See Media in Wichita, Kansas. US-56 highway runs east-west along the north side of the city, and K-15 highway is 0.5 miles (0.80 km) northwest of the city. Alfred Schroeder Field airport, FAA:M66, is located immediately adjacent to the west of the fair grounds and centered at 38°20′35″N 97°12′51″W﻿ / ﻿38.34300°N 97.21416°W﻿ / 38.34300; -97.21416. DSL is provided by CenturyLink. Cable is provided by Eagle Communications. Wireless is provided by Pixius Communications, Rise Broadband. City is provided by Kansas Power Pool, billed by City of Hillsboro. Gas is provided by Atmos Energy. City is provided by City of Hillsboro. Rural is provided by Marion County RWD #4. Service is provided by City of Hillsboro. Hillsboro, City on the Prairie; Raymond F Wiebe, Multi Business Press; 1985. The Centennial Celebration of Hillsboro - May 18–27, 1984; Hillsboro Centennial Committee; Baker Brothers Printing; May 1984. Hillsboro Diamond Jubilee. Glimpses of Our Heritage, June 8–10, 1959; 1959. A Guide to Hillsboro, Kansas; Mennonite Brethren Publishing House; 1940. Sixtieth Anniversary of the Johannestal Mennonite Church, 1882-1942, Johannestal Mennonite Church; 1942. The Story of Gnadenau and Its First Elder, Marion County Kansas, David V Wiebe; Mennonite Brethren Publishing House; 1967. ^ a b c d e f Geographic Names Information System (GNIS) details for Hillsboro, Kansas; United States Geological Survey (USGS); October 13, 1978. ^ a b Hillsboro Kansas, The City on the Prairie; Wiebe, Raymond F; 1985. ^ "Kansas Post Offices, 1828-1961 (archived)". Kansas Historical Society. Archived from the original on 9 October 2013. Retrieved 14 June 2014. ^ "History". Tabor College. Retrieved 2010-12-25. ^ Repairs begin on Friesen Mill in Hillsboro; Hillsboro Free Press; June 3, 2014. 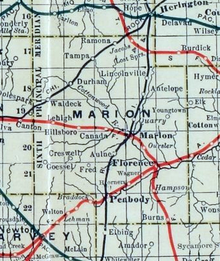 ^ Marion County Schools; Genealogy Trails. ^ Hillsboro Industries - History. ^ Wal-Mart announces plans to build store in Hillsboro; Hillsboro Free Press; September 11, 2014. ^ Hillsboro grocers worry about Wal-Mart’s plan for Neighborhood Market there; The Wichita Eagle; September 11, 2014. ^ Wal-Mart makes it official; Hillsboro Free Press; September 17, 2014. ^ Tabor College and USD 410 Break Ground for New Athletics Facility; tabor.edu; November 17, 2008. ^ "KSHSAA State Tournament All-Time Bests: Girls Teams" (PDF). Kansas State High School Activities Association. Retrieved 16 January 2018. Wikimedia Commons has media related to Hillsboro, Kansas. Historic Images of Hillsboro, Special Photo Collections at Wichita State University Library.